Fashion trends used to consist of growing the hair long, cutting it short and combing it in creative ways. Along with this were various clothing designs including bell bottom pants, short skirts, jackets with shoulder pads, etc. Any of these could be easily adopted by the masses without pain or the spilling of a single drop of blood. But as our world seemingly spins out of control, moving way too fast for the average human being, we find the ravages of this everywhere we turn. More and more children are born with Attention Deficit Syndrome. Too many responsibilities and events on the schedule are draining people of their energy through Chronic Fatigue Syndrome. Information overload is causing vast numbers of the citizens to require anesthetization with Prozac in order to cope with daily life. A simple swim in the surf no longer feeds a ravenous inner hunger for thrills and spills. This is now being replaced with extreme sports, such as scaling a vertical precipice or jumping out of an airplane. People today will do and spend whatever it takes to reverse the effects of aging on their bodies. Humans nowadays are so wound up and over-stimulated that it seems that nothing short of blood-letting will feed the fashion frenzy. Spreading across the world over the past two decades or more is a pervasive trend toward body tattoos and skin piercings. It seems to have proliferated in most Western countries and many Eastern countries as well. Many people who, by nature, would not seek out a tattoo in their lifetime, now sport one or even two tattoos. Around the time of the Second World War, the only people sporting tattoos were sailors who got them in foreign ports, generally brought on by a state of drunkenness. Today, there are even reality TV shows centered around tattoo parlors. And beyond these now commonly accepted practices of tattooing and skin piercing is an extreme minority who hang weights and objects from such piercings, sometimes as part of a stage show. There have been many primitive societies in Africa among other places in which ritual scarring has been the norm, as a testament to a boy’s rite of passage into manhood. But how do we explain our recent trend? Some dismiss this wave of tattooing and skin piercing as a fashion statement. Some say it is a statement of protest and non-conformity with societal norms. Some speak eloquently of the artist’s brush on the human canvas. One could argue the merits of all these points of view. Different people, different reasons. Even though the vast majority of people undergo tattoos and piercings in the name of beauty and fashion, it is interesting to note that both these invasive processes require the piercing of the skin with sharp needles and that in both procedures, blood-letting is a side effect. Though blood-letting is not the real purpose of either of these techniques, it is nonetheless a distinct consequence as is the sensation of pain that accompanies the blood-letting. In addition, people are flocking to plastic surgeons and dermatologists for surgery, liposuction, botox and collagen injections, and various other methods, all of which require blood-letting. All these appear to be types of bloody sacrificial offerings to the gods of beauty and fashion, in exchange for beauty or eternal youth. It harkens back to ancient times when a goat or sheep was sacrificed upon an altar of stone so that the gods would be pleased and wishes would be granted. The Mayans, among others, commonly sacrificed humans to appease their gods. But what gods do these offerings appease? They must be gods who represent the darker forces since a simple prayer, a flower, a fruit or a stick of incense is somehow not enough. Human blood and pain is what seemingly piques their interest and causes them to reciprocate. If we draw upon yoga philosophy and the ancient Vedic tradition, we find some interesting and enlightening perspectives with regard to such behaviors. In the Bhagavad-Gita, the “Song of God,” Krishna who is God tells his friend and disciple, Arjuna, that nature consists of three modes or mind-sets — Contentment, Desire and Delusion. When a soul takes birth, that is, comes into contact with material nature, it becomes conditioned to act and respond in accordance with one or more of these three modes or mind-sets. The mode of Contentment is illuminating and conditions one to peace and happiness. The mind-set of Desire produces unlimited desires and longings and robs one of peace of mind. And the mode of Delusion conditions one to destructive behavior, pain, and mental imbalance. Since very few of us are self-satisfied and conditioned to peace of mind and happiness, it seems clear that we are steadily sinking by degrees into the mode of Delusion. Most of us have been entrenched for generations in the mind-set of Desire as we chase the latest fads and fashions and pursue our pleasures outside of ourselves rather than from within. But now the shadow of Delusion is beginning to loom large over our lives as we reach for sharp needles — some that poke holes in the skin through which to hang metal fixtures and some that inject colors. People pay extraordinary fees to go under the knife and have their most intimate body parts sliced and sculpted while under anesthetic. Extreme fashion has become the norm. No blood and pain — no beauty and gain. In Vedic iconography, the goddess Kali probably best embodies the notion of one who is appeased by blood sacrifice. The wild and uncontrollable Kali, the goddess of darkness, embodies the principles of wrath, destruction and death. This fierce black goddess has an awesome and terrifying appearance. As all colors disappear into black so all names and forms disappear in the blackness of Kali. Her body is black because she is the embodiment of tamas or the mode of Delusion. She is the personification of night which swallows all that exists. People who bow down and make blood offerings to Kali either tend to live outside the accepted and enforced order of society or they express their contempt for such order and its dictates and limitations upon their behavior (eg. tattoos and piercings). Or they are among the outcasts. Kali appears gaunt with sunken, bloodshot eyes. long sharp fangs, gaping mouth, protruding tongue, long claw-like nails, blood smeared upon her lips and trickling from her mouth. Kali is known to get drunk on the warm blood of her victims and to use human skulls as drinking vessels. Her luxuriant hair is disheveled symbolizing her freedom and detachment. She wears an apron of human hands and a garland of human skulls which are the remnants of her mission of bringing death and destruction to bewildered humans. Upon her wrists, she wears serpents as bracelets. This is a dreadful visage to ponder. But even today in India, there are still those who make blood offerings to Kali devi. Just how much does Kali appreciate blood or even death sacrifice? Recently in India, thousands of people were lined up walking up a steep, narrow two-and-a-half-mile path to a Goddess Naina temple, a form of Kali, north of Delhi on pilgrimage. As heavy rains began to pour down, stones were loosened from atop the hill which rolled down upon the crowd. People panicked and began to stampede, trampling others underfoot. 145 people were killed leaving behind a scene of carnage, littered with bodies, sandals, flowers and torn clothing. The Vedas further explain that according to one’s conditioning by the three modes of nature, people worship different beings or forms of the demigods. The highest form of worship is that of God. The next level down is the worship of particular demigods or archangels who are in charge of various universal affairs. For example, one may worship the Rain god, Indra, in order to pray for rain or the Sun god for improved health. The worship and veneration of saints could also be included within this category. The next category would be worship of humans and ancestors. Ancestor worship is still popular in many places, such as Mexico and the southern US. The next level is the worship of demons or destructive forces, such as Adolph Hitler or Robert Mugabe. 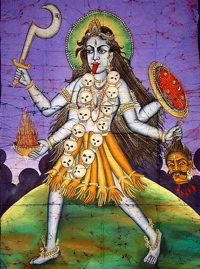 Kali devi may also be included in this category as a Goddess of Destruction. And the lowest level of worship is that of ghosts and spirits, such as one would find in black magic traditions, such as voodoo and Santeria. So here we clearly see that this practice of blood-letting is not a product of the light but more clearly a product of the darkness. You may argue that if one tattoos the symbol ‘om’ or a cross on their shoulder that that is a manifestation of divine energy or religious iconography and that may well be true. But the body still had to be sliced and bled out in order to do it. This should be proof enough that we are sinking into the darkness. We must pull ourselves out of the darkness and step into the light. And that means we must raise ourselves up into the mode of Contentment or Goodness. And the only way to do that is to get closer to God, closer to source. We must go within ourselves, not driven by despair but with an intentional effort to commune with God, with Spirit, with our Higher Self, the Supersoul. We must learn to trust that inner voice, the conscience, the intuition, in order to learn what is best for us — what thoughts and deeds will reflect our best interests. Don’t put yourself into the hands of self-interested and manipulative humans, but place yourself in the loving hands of Krishna or your concept of God. Stop torturing and tormenting yourself and start treasuring and treating yourself like the exalted soul you are. End the pain and punishment and ascend into love of self and love of God.